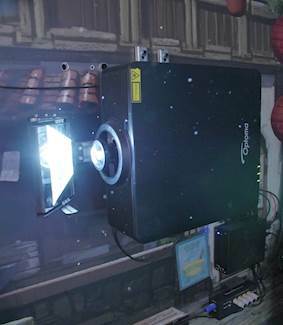 A rear projected interactive game using ZU650 laser projector with short throw lens and Kinect V2 sensor. Leslie Technical Services provides technical consultancy, develops bespoke interactive systems and implements turnkey solutions for museums, retail, exhibition, event and creative industries in Audio Visual and Immersive technologies. "The ZU650 was the perfect solution for this project. It was the only pro install 5-6000 lumen laser phosphor projector on the market that would fit into the space in portrait mode, with the right throw ratio and within budget." "This game works brilliantly. It is always a challenge to retro-fit installations into existing spaces so it needs flexibility in the equipment. I do not think this project would have been possible without the Optoma ZU650. It was perfect for us with its pro install cutting-edge lamp-less technology and challenging budget." "This installation has made such a difference. It was previously quite a static area. Now, visitors can let off steam and interact with the exhibits making the whole experience so much more memorable - and fun!" Shrek’s Adventure! London: Unleash your Panda Power at Shrek’s Adventure! Задача: Shrek’s Adventure! London wanted to update a themed area with an interactive experience to coincide with the release of the new Kung Fu Panda 3 film. 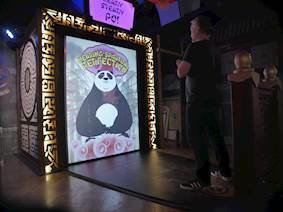 Решение: Leslietec developed an interactive game using Optoma’s ZU650 laser-phosphor projector that encourages visitors to mimic eight of Po the Panda’s classic Kung Fu poses. Shrek’s Adventure! London wanted to update a themed area with an interactive experience to coincide with the release of the new Kung Fu Panda 3 film. Shrek's Adventure! London is a collaboration between Merlin Entertainments and DreamWorks Animation. The attraction takes guests on a journey to Far Far Away Land in search of Shrek. The interactive walkthrough adventure includes a character courtyard where visitors meet Shrek and his swamp friends along with characters from Madagascar, Kung Fu Panda and How to Train Your Dragon. Matthew Ringland and Richard Hollyer, experts in attraction design and planning, were appointed to oversee the new experience. Leslietec has worked closely with Pinewood Creative as technical partners to deliver a number of successful projects for Merlin entertainments and paired up again with Ringland and Hollyer to develop an interactive game using motion tracking technology. The refurbishment of the ‘Valley of Peace’ called for a number of fun hands-on interactives to be developed using a variety of sensor technologies. These would trigger unexpected sounds as visitors interact with the space. 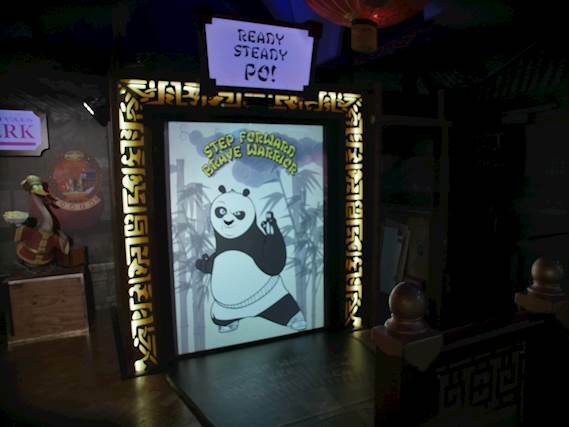 The centrepiece for the experience would be an immersive interactive game featuring Po the Panda, the title character in the Kung Fu Panda franchise. The game encourages visitors to match Po’s Kung Fu skills and score points along the road to enlightenment. To develop a fun interactive game that visitors could get into very quickly and interact with intuitively. To develop and integrate the game system into an existing space. For it to operate seamlessly in an unmanned environment. To deliver the project from start to finish in four weeks. It was quickly apparent the image would need to be rear-projected from within a confined space onto a life-size human scale screen. Leslietec has years of experience integrating audio visual hardware into difficult spaces and one of its skills is having a can-do approach to challenges that do not immediately seem possible. The projector and processors needed to produce very little heat, had to be mounted into a non-controlled environment, needed minimal maintenance and interaction from staff, and have pin-sharp image quality. It needed a short throw 0.8 lens to get the projector into the tight space and had to be mounted in portrait mode with a mirror rig. The gesture tracking also had to be incredibly accurate in order to focus on a single user in a busy and active space. In addition, the team would have a tight timescale of just four weeks from being given the brief to the opening of the installation. Leslietec developed the game which would encourage visitors to mimic eight of Po’s classic Kung Fu poses within a set time to become the ultimate Dragon Warrior. It gave an outline of the number of Kung Fu poses needed to DreamWorks, who provided all images for the game. The team installed the Optoma ZU650 6,000 lumen lamp-less laser-phosphor projector. This high brightness WUXGA resolution ProScene model with 2,000,000:1 dynamic contrast provides an astonishing 20,000 hours of impressive, virtually maintenance-free operation without the need for lamp or filter replacements. And because there are no lamps, the projector needs less cooling, so is ideal for quieter environments, smaller rooms or those with low ceilings. The projector was mounted in portrait using a bespoke engineered rig by Leslietec incorporating an Audipack mirror mount with a first surface mirror to project the animated image onto a bespoke 1.5m wide and 1.8m high Translite® rear projection screen from Harkness. A protective optically clear 10mm perspex panel was placed in front of the screen to protect the system from boisterous gameplay. As the screen was a non-standard aspect ratio, it was a challenge to get the exact image size needed. The team calibrated the system to over-project and then bracketed the software to make the image fit exactly onto the screen with no leakage outside the screen area. Having previously delivered a number of installs using motion tracking technology, Leslietec has developed bespoke Kinect sensor tracking software - capable of very accurate bracketing of the interactive space. This is necessary when installing into unmanaged public spaces with high footfall as it allows interactive game play without spectators clashing or confusing the tracking algorithms. The audio was delivered using active JBL control 50 system with unobtrusive satellite speakers and Sub. The new exhibit was launched for Easter to coincide with the release of the latest film, Kung Fu Panda 3. Guests are invited to unleash their ‘Panda Power’ and warrior reflexes in the shadow Kung Fu game. The eight poses take around one minute to complete - important in the game design to ensure smooth visitor flow through the zones in the attraction. During the busiest time a new group comes through the attraction every six and a half minutes. The equipment does not need cooled racks and through the lamp-less technology of the ZU650 projector, there are no ongoing costs for the attraction in terms of lamps. Short throw on-axis projection necessitated rear projection and the rear pro screen from Harkness eliminated any issue with hot spotting. Rear pro also makes the install more secure with the hardware away from little fingers. Alastair added: “Through all of the interactive installations we have done, we have learned to install systems that are robust and need no interaction from staff at the visitor attraction. The system is fully automated attendant free and the ZU650’s integrated PJlink control option makes control of the projector over the in-house show control system a doddle”. As well as the Kung Fu Panda game, in the new experience visitors can embrace their inner peace and defy gravity with Shifu’s meditating levitating cloud, become true warriors by chopping a log in half and take the punch bag challenge.